The Archbishop's Palace stands to the east of the cathedral on land bought in 1530 by the first holder of that position, Juan de Zumárraga. Fanny Calderon wrote: "Were I to choose a situation here, it would undoubtedly be that of Archbishop of Mexico, the most enviable in the world to those who would enjoy a life of tranquility, ease and universal adoration. He is a pope without the trouble, or a tenth part of the responsibiity" (p. 34). 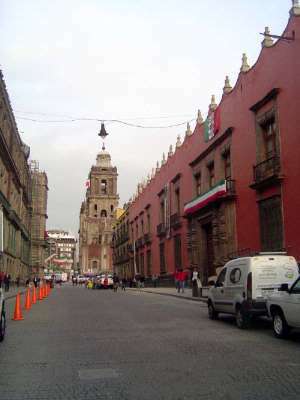 The sinecure was disrupted in 1857, when Benito Juárez confiscated the property and assigned it to the finance ministry. The building is now a museum.